Douglas Conant, former CEO of the Campbell Soup Co.
How often do you pause to smell the roses appreciate and celebrate your achievements? In her study, Teresa Amabile from The Harvard Business School analyzed nearly 12,000 diary entries from 238 employees and found out that the efforts of tracking achievements every day dramatically enhanced the workers motivation. It comes down to physiology: every time we record a ‘win’, the neurotransmitter dopamine is released which energizes us and gives us a feel-good aura. Before we know it, we become ‘addicted’ to that feeling and want to replicate it, prompting a success loop. Now, that doesn’t sound too bad, does it? At OnePageCRM, we recognise your need to celebrate your success, and we encourage it. Now, you have an opportunity to not just close the deal and move on to the next, but to recognise your sales victory and preserve it. Introducing the Pipeline Won Column. If you’re using the OnePageCRM Pipeline, chances are you’ve come to appreciate its Kanban view. It neatly visualizes your deal progress and makes it even easier to update it, with a simple drag-and-drop. As you advance your deal across the stages (say, from qualifying the lead to sending your new client a contract), you get the sense of progression. It’s a journey that culminates with the satisfaction of a closed deal. But what if the deal is done but you’re not quite finished yet. You don’t want it ‘out-of-sight-out-of-mind’. For example, the contract is signed but needs amendment or you need to remember to follow-up with a personal ‘welcome note’? 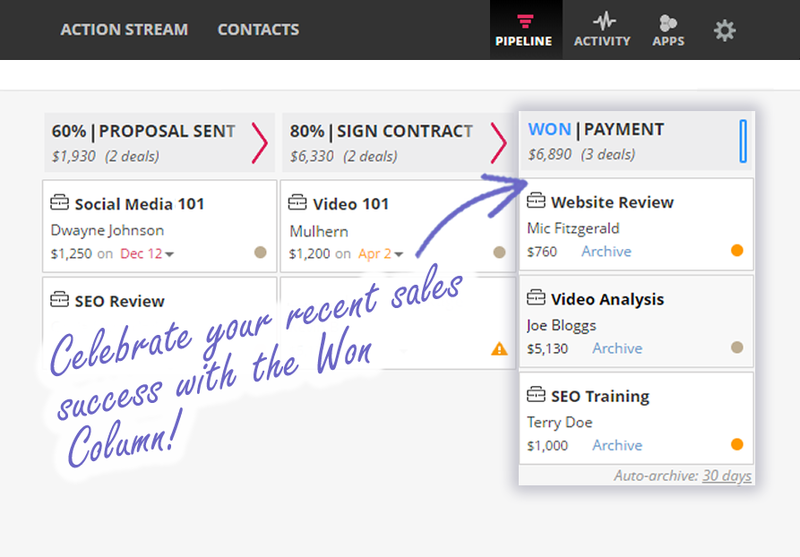 With the new Won Column, your closed deals will not get lost among the other statuses in the deal list. 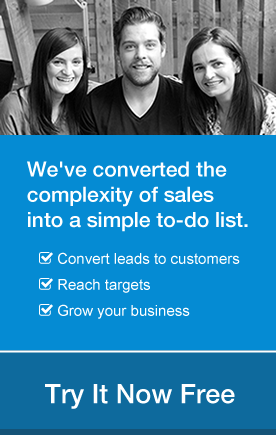 They will be neatly kept as the last stage of your sales cycle. Practical uses aside, the Won Column is also your achievement board. Yes, you might need to complete some follow-up actions or get an extra update, but nobody is taking away from the fact that you’ve won those deals! Remember, that good old dopamine rush is good both for your physical and psychological states. So go ahead and bask in the glory of your sales success! Doctor’s orders. When you log into your OnePageCRM and check out the Won column for the first time, your two last won deals will already be logged there! That little bit of motivation to start your day. 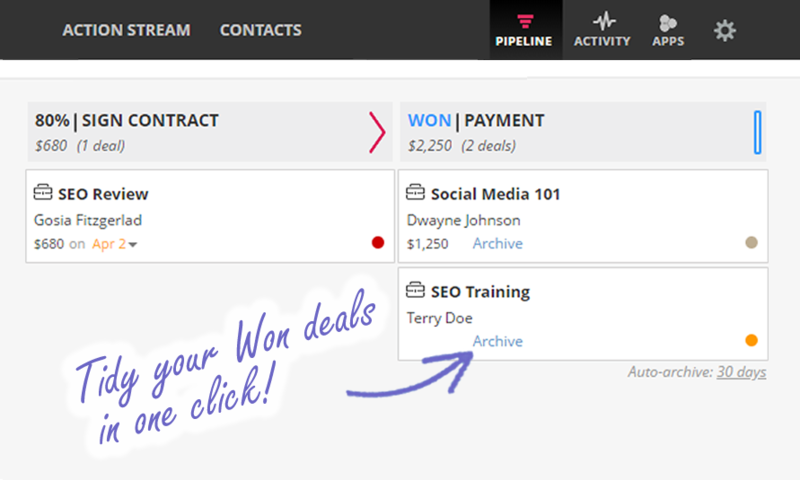 From now on, all your won deals will be automatically added to the column. Hit a setback and need to change the deal’s status from Won back to pending? Not a problem. As before, you can do so with a simple drag-and-drop. Let’s say, you’ve truly and fully completed the cycle for the deal. No follow-ups needed, no signatures forgotten. You have enjoyed looking at it, sitting prettily in the Won column, for a good while now. You’re ready to say ‘goodbye’ or maybe you never wanted to keep that deal on display in the first place. Just click ‘archive’ at the bottom of the deal and it will be automatically moved to the deal list below. We like to keep your workspace tidy. 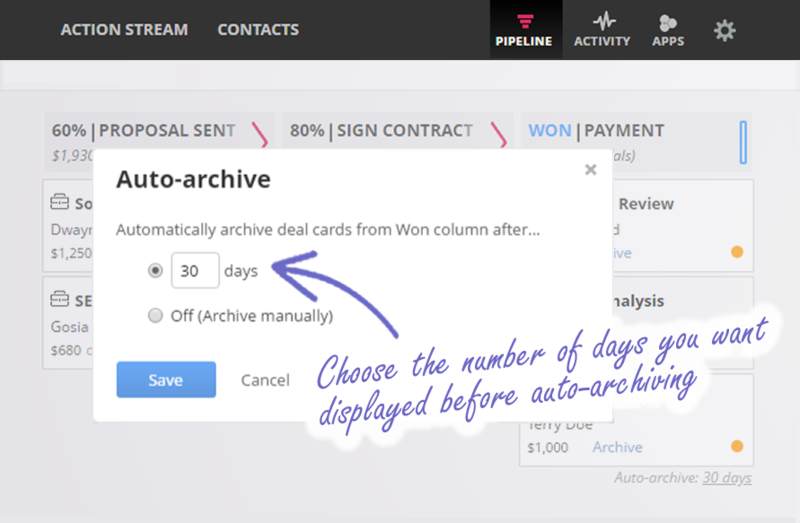 So if you don’t archive the deals manually, they will be auto-archived after a set period of time (30 days by default). You can change that period or even switch this function off completely by clicking on the link below the column. Feel like enhancing your Won column or bringing some of the archived deals back? Just move the needed deal to one of the previous stages, mark it as ‘won’ once more… and Voila! If you prefer to remove the Won column, simply click on ‘edit stages’ and ‘hide’ it. The choice is yours! After all that effort you put into closing those deals, you deserve to take time to mark your achievements. 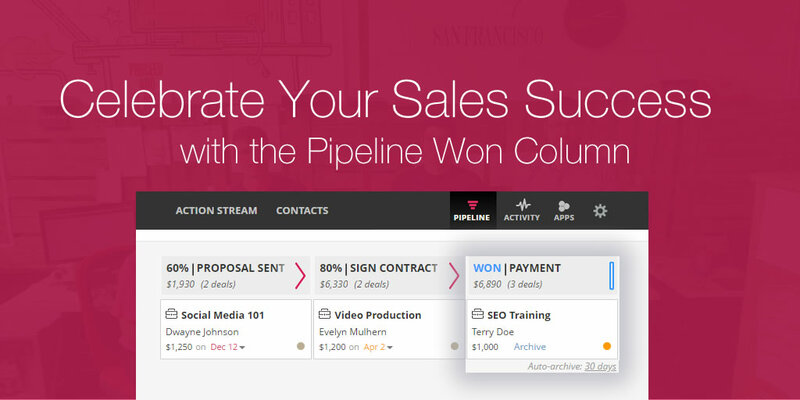 So, go ahead, enjoy and celebrate your sales success with our Won column! Have you used the Won column already? What do you think? Tell us in the comments below or tweet us @OnePageCRM.